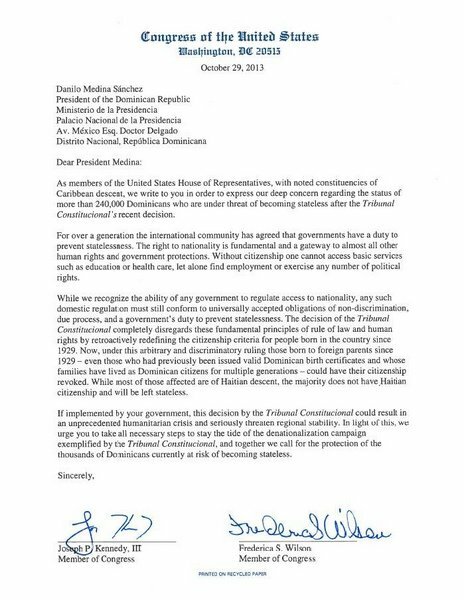 Take a look at this... a letter, dated 29 Oct 2013, from United States Congress to Dominican Republic President Danilo Medina regarding the denationalization of Dominicans of Haitian decent. Congresswoman Frederica S. Wilson (FL-24) and Congressman Joseph P. Kennedy III (MA-4) submitted a letter to President Danilo Medina of the Dominican Republic in response to a recent Dominican court ruling that makes many Dominican citizens of Haitian descent into outsiders in their own country. The ruling by the Dominican Republic's Tribunal Constitucional in TC/0163/13 strips persons born on Dominican soil to parents without legal documentation of their citizenship rights. "For over a generation the international community has agreed that governments have a duty to prevent statelessness. The right to nationality is fundamental and a gateway to almost all other human rights and government protections. Without citizenship one cannot access basic services such as education or health care, let alone find employment or exercise any number of political rights." "This decision by the Tribunal Constitucional could result in an unprecedented humanitarian crisis and seriously threaten regional stability. In light of this, we urge you to take all necessary steps to stay the tide of the denationalization campaign exemplified by the Tribunal Constitucional, and together we call for the protection of the thousands of Dominicans currently at risk of becoming stateless."